We met a group of my husband's gym friends who get together every month for a "final Friday" gathering. 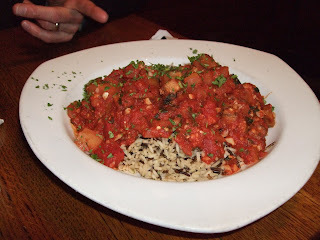 Recently their venue has been Olive's, a restaurant that has filled a niche in Clifton for the past couple of years. While the cooking is serviceable at best, the place has managed to hang in there by doing a few things well. Start with a good location and ambiance for the upstairs sections--as opposed to the chilly and rather gloomy large dining room downstairs-- where a large bar and many bar tables provides a nice perch for watching the sidewalk action on Clifton's main commercial drag. Daily specials -- including two-for-one martinis on Fridays -- are a good idea and I'm sure it's helped keep patrons coming in the door. The menu is pretty wide-ranging, with appetizers (mostly fat-laden but that's what a lot of people like), salads, sandwiches and a fair number of entrees. The portions generally are large and the kitchen is rather heavy-handed with butter and oil. Therefore, it's a challenge to find healthy options. 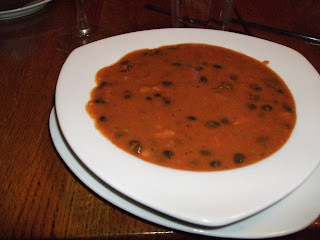 Pictured here are a soup special -- it was black bean and red pepper, rather an odd combination and someone overdid the salt, so I could only eat a little of it. My husband often orders the pasta puttanesca, which is a vegan dish--tomatoes, eggplant, and a spicy kick perhaps from cayenne pepper. It's listed as an appetizer for some reason, but it's plenty as an entree. 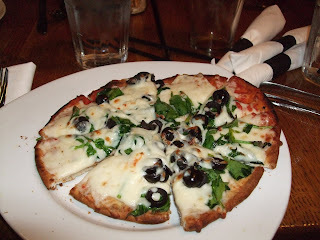 I also got an individual flatbread, kind of like a small pizza with a very thin crust. Olive's is open seven days a week for lunch and dinner, and also serves brunch on Sunday. Sausages may not be the healthiest foods in the world, but when they are handmade by local experts who have been doing it for well over 30 years, they may have a place on the healthy foodie's table -- at least, once in awhile. Kroeger & Sons Meats in the Market House at Findlay Market showcase an amazing array of interesting meats along with the homemade sausages, including cuts of veal, pork and lamb that aren't that easy to find. 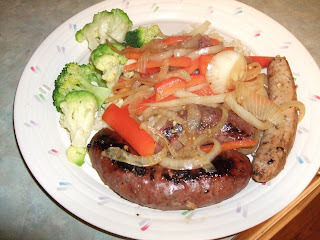 The pictured dish is sauteed bison and duck sausages with strips of red bell pepper and thinly sliced onion. The preparation couldn't be simpler. Note that with these lower fat meats you need to add some canola oil to the pan, or the dish will turn out too dry. Here's a scrumptious pasta dish that's easy to make--just buy refrigerated tortellini at the grocery store. For a lighter version, use whole wheat penne pasta, and/or add chicken or shrimp for an extra protein boost. Or make it just like I did, using this recipe. In a large frying pan, heat the oil over medium-high heat. Add zucchini and pepper and stir-fry for three minutes. Add garlic and asparagus and stir-fry until veggies are crisp-tender, about another five minutes. Reduce heat to medium and add salt, zest, broth and capers. Cover and simmer until sauce is heated through. Cook tortellini according to package directions, drain and add to sauce in pan. Stir in cheese, lemon juice and pepper until the cheese has melted. Serve immediately. This goes well with a crisp, acidic white wine, such as Sauvignon Blanc. Add a small salad and some crusty bread (if you can handle that many carbs), and it's a meal. UC undergraduate foodie/writer/blogger/journalism major Emily Lang (left) published a superb piece of reporting in her column in the school's award-winning newspaper this week about how the U.S. Supreme Court's decision to lift restrictions on corporate funding of campaign advertising is likely to affect what Americans eat. Lang quotes food policy expert Marion Nestle, who thinks that the decision will hinder the work of those who "care about creating a good, clean, fair and sustainable food system." I hadn't thought about the ramifications of the ruling on this important cause in my own life. Thanks to Ms. Lang for the column. Rather than paraphrase, I'll direct you to this link so you can read what she wrote. This joint is always jumpin'--and we can see why. The place has a convivial, welcoming feel, the prices are reasonable for what you get, and the food seems to please a wide variety of people. Even though it's a fish house, we know people who swear by some of their meat dishes. For the healthy foodie, the seafood fills the bill just fine, though. 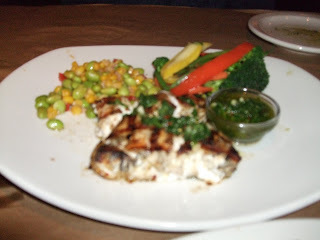 The best bet on the menu for healthy options is the grilled fish section, where you select from a daily catch of 6-7 types of fish. To go with it, choose one of the sauces--most of which have healthful ingredients--and one side dish. On our last visit a few days ago, we strayed from that section. 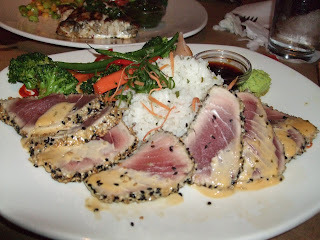 My husband ordered a grouper special (top photo) and I had the ahi tuna with sticky rice and sauteed Asian veggies. We each had a glass of wine with dinner (after cocktails at the bar on our way in). The wine by the glass prices are a little high, but at least they give customers a generous pour. Our friend Susan Howell was along that evening, but I didn't photograph her dinner for reasons I can't recall. I do remember that she took half of her tilapia home. Forgive my memory lapse, Susan! 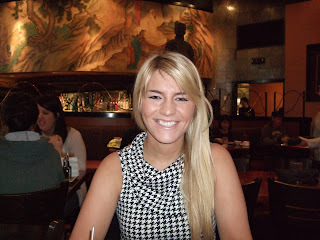 This weekend I met one of my favorite former students -- the beautiful June '09 grad, Reagan Russo (top) -- for wine and healthy food at PF Chang's in Hyde Park. Of course, Chang's is a national chain and an experience similar to ours can be had in multiple locations. We both wanted a lunch that wouldn't be full of fat and calories, and our server steered us through the best menu choices. Reagan had the lettuce wraps -- which, if you ate the whole thing, you'd be going overboard by our standards. She was able to feel satisfied after eating about half of the filling, so she brought the rest home. I had my standard order of the Buddha's Feast (pictured), steamed rather than stir-fried. (I've had it both ways.) 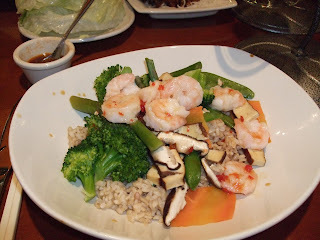 With brown rice and added shrimp -- it comes with tofu amid the crisp-tender veggies -- and plenty of added soy/mustard sauce, the dish was delish. Of course, most of the fun was in seeing Reagan again after too long. But we also were happy to have selected a good-for-us meal. This coming Tuesday, January 26th, you can see "Fresh -- new thinking about the way we are eating" for free. Go to Room 500, Swift Hall on the University of Cincinnati's Clifton (main) campus. The room opens at 6:30 and the film starts at 7:00 PM. From what I have read, while the topic is similar to the terrific "Food, Inc," its orientation is more about what individuals can do to get themselves and their families out of the industrial-food system, and also how to help change things for the rest of the world. 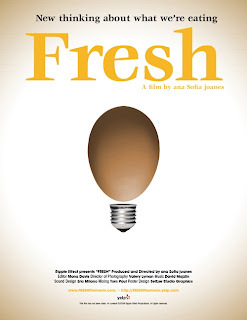 Read more about "Fresh: the Movie" by clicking on the title. We'll be there, so if you can make it, please say hello. I'm excited about the chance to see this film. Here is a GUEST POST from Physical Therapist Shannon Wills. I don't know her personally, but she asked to contribute the Healthy Foodies blog, and this is her interesting article about why and how to add more raw foods to what we eat. Thanks, Shannon! Include more juices and cold soups with your meals: Juices retain all the goodness of fruit and vegetables if you don’t add sugar or anything else to them. They also provide you with instant energy, and with fiber if you don’t strain them. And they’re rich in vitamins and other nutrients. Juices and smoothies make great breakfasts on the go, when you’re pressed for time or when you need to pep yourself up before a workout. Also, because they digest fast, juices don’t make you feel full or lethargic like you do after a heavy meal. Eat a salad every day: The best way to include an adequate helping of vegetables in your daily diet is to eat a salad every day, at lunch time. Not only does it fill you up and prevent you from eating junk food that’s not healthy, but it also provides you with raw energy and vitamins. Avoid the dressings as much as possible and instead, use herbs and seasoning to add taste to your salad. Munch when hungry: I don’t mean you should reach for that bag of potato chips or pretzels. Instead, keep a box of sliced carrots or celery sticks in your fridge so you can dip in when hungry. Also, nuts and dried fruits like dates and figs make great and nutritious energy snacks. Nuts contain fats that are good for your body and that prevent illness and disease, and they’re healthy alternatives to fried and processed food. Go raw once a week: While it may not be possible to eat raw every day and for every meal, you could assign one day of the week to eat only raw food. It not only helps you get accustomed to a raw diet but also helps to detox your body and free it from the poisonous residue of undigested food that line your stomach walls. 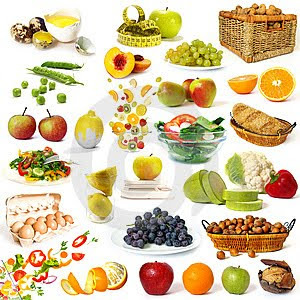 You feel fresher and more energetic than before, so switch to raw once a week in order to become healthier and fitter. This article is written by Shannon Wills, who writes on the topic of Physical Therapist Assistant Schools . She welcomes your comments at her email id : shannonwills23@gmail.com . There is some controversy about whether we should snack between meals, but the consensus seems to boil down to: snacking is inevitable, so strive to make healthy choices. The key to living up to that goal rests on having those healthy snacks at hand. If you go to work, let's say, without having packed a few good-for-you noshes, you're likely to succumb to the lure of vending machines or your coworkers' offers of cookies and candies. I stock my office with non-perishable snack foods such as high-fiber, low-sugar cereal bars, a couple of apples or tangerines ("Clementines" last for days without being refrigerated and are very easy to eat), and perhaps trail mix or nuts. If you have a fridge handy, individual servings of yogurt are great to have nearby, too. The Mayo Clinic has a helpful list of 100-calorie snacks, many of which are completely portable. I'm not sure why this particular combination of vegetables tastes so delicious, but I think it's something about the mixture of fennel and eggplant. 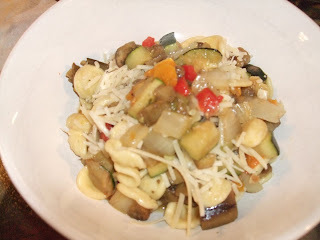 Or maybe it's just everything, including the peppers, garlic, and zucchini. Whatever the explanation, I love this dish! Try it and see what you think, but don't substitute or leave out anything or you probably won't get the full effect. Many of my friends have said they don't make fish at home very often because they don't know how to cook it. In fact, I think it's the easiest--and fastest--way to make a healthy dinner. Just follow a few simple suggestions and you'll find it's pretty foolproof. Of course, we all know that fish is marvelously healthy and that we should all eat more of it, right? So the only question is, what's the best way to do so. Health wise, you are almost always better off preparing your own food, versus eating at a restaurant or picking up something already made (whether it be at a gourmet-to-go place, your supermarket's ready-made case or the drive-through). 1. Buy fillets, either fresh or frozen. I shop at Luken's (Findlay Market) for fresh fish, but also at Bigg's, and at Trader Joe's for frozen. 2. My go-to method is to saute almost any kind of fish in a pan. Use one with a nonstick surface and you really don't need any oil, although a little olive oil adds a nice flavor. 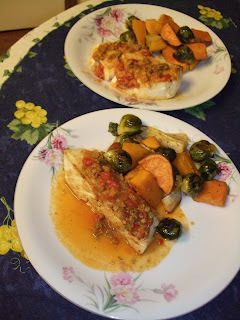 I find that it's too easy to overcook fish in the oven, and most fish is too delicate to hold together on the grill. 3. Heat the pan over medium to medium-high heat. Season your fillets with salt and pepper and other herbs or spices that you like. Cook on one side for a couple of minutes, until it's starting to brown. Carefully turn over (with tongs or a spatula) and cook the other side. 4. Reduce the heat to low, cover and simmer for a few more minutes. Almost all varieties of fish are incredibly quick-cooking--a real plus for the weeknight cook! 5. Add a few ingredients to the pan to make a sauce. Squeeze a lemon over top, sprinkle some chopped garlic in the pan and stir; spoon a pesto sauce or jarred tapenade--the possibilities are endless! 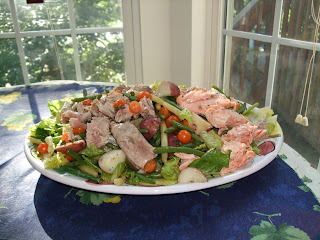 I'm adding a few shots of fish I have made this way, including a salmon and tuna salad where I put those fish, cooked in a pan, over greens and added potatoes, green beans, capers, tomatoes, etc. The others are grouper and tilapia. Don't be intimidated by cooking fish--it's easy, and you'll love the results! This is one of my favorite Cincinnati restaurants, and one of the best brunch spots on my side of town. We took my mom and brother (visiting from Florida) and had a good time. I always love the Mexican hot chocolate -- spicy with chili, not too sweet and not loaded with cream. But it was a challenge to find a healthy option. 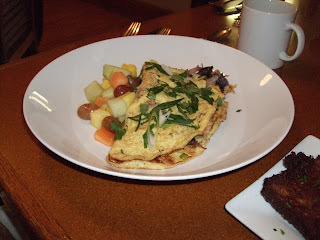 My husband's omelet with Asian ingredients--including shrimp--and a side of fruit salad was the healthiest choice. 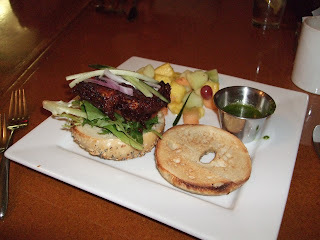 My vegetarian bagel might have been OK except for the fried cheese (oops) that was its centerpiece. Still, I love Honey and recommend it! If you want a healthy meal before or after the movies at Newport on the Levee -- or at any of the seafood chain's 16 other locations -- Mitchell's Fish Market is your best choice. (My last name is Mitchell, but I have no connection.) In addition to an extensive regular menu, daily and weekly specials provide plenty of options. The $19.95, three-course special is hard to beat. Although we didn't see it on the weekend menu, our server was happy to offer this special when we asked. You get a choice of a house or caesar salad, one of three seafood entrees, and a dessert. 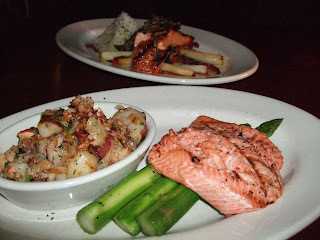 I took the deal, and picked the house salad, grilled steelhead (somewhere between salmon and trout) with potatoes and asparagus, and creme brulee. 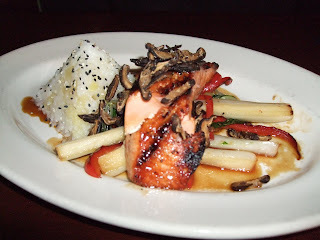 My husband had a salmon special (also pictured) that was accompanied with sticky rice and steamed Asian veggies. We like their cocktail, beer and wine choices, too. From a prominent guru of healthy eating, this is Michael Pollan's new handbook of easy-to-remember tips for what he calls "simple ways to navigate the treacherous landscape of modern food and the often-confusing science of nutrition." He wants us to eat more food rather than food products, processed, chemical and additive enhanced abominations that populate our grocery shelves and fast-food menus. Eat real food, not too much of it, and more plants than meat. In his new guidebook, he presents 64 straightforward guidelines, each with a short explanation. 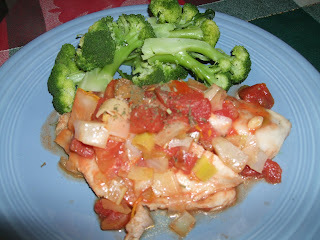 Here's an easy-to-fix, tasty and healthy meal -- my favorite kind! For the sauteed halibut, heat a skillet to medium high; add a coating of vegetable oil if you are not using a nonstick skillet. Saute until golden on each side two halibut fillets that have been sprinkled with salt and pepper--about 2-3 minutes per side. Reduce heat to medium or medium low, cover and let cook another 3-4 minutes. Remove cover and squeeze 1/2 lemon over top of the fish. Spoon on top of each fillet about 2 tablespoons of Trader Joe's Artichoke-Red Pepper topping (found with the mustards and capers). Cover and heat through for just another minute or two. That's it! 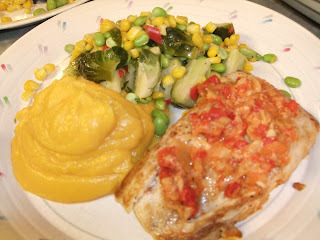 A lovely meal; serve with crusty, warm bread and a glass of sauvignon blanc or pinot grigio. Canned soup not your thing? Here's one of my favorite soup recipes, though it's really more of a stew. The flavors meld together seamlessly into one mouthful after another of gumbo bliss. I like to add more hot sauce to my portions, while my husband prefers a milder version. Feel free to ramp up the garlic in this recipe, if you like. Fresh okra is seasonal (late spring until first freeze), but you can also use frozen okra in this recipe. If so, eliminate step 1 below and add frozen okra in step 3. 1. Heat 2T oil/butter over medium-high heat in a skillet. Add okra and sauté, stirring often, for about 8-10 minutes until “roping” (thin strands of white substance) subsides. Set aside. 2. Heat remaining oil in a large Dutch oven over medium-high heat. Add pepper, garlic and onion and sauté until veggies turn translucent, about 5 minutes. It's easy to pack on (or keep on) the pounds this time of year, but spring and summer will arrive before we know it -- thank goodness -- and we should plan now for swim-suit season. Even if you never bare all in a skimpy suit or other revealing clothes, your wellness depends on maintaining a healthy weight. Keep soup on your menus and the task will be easier. The liquid content makes soup more filling than less-liquid foods. Be sure to avoid cream soups, which add empty calories and "bad" fats, and compare labels on canned soups so you can choose lower-sodium varieties. Above is a photo of my favorite canned soup, Trader Joe's lentil vegetable. Of course, nothing beats a good quality chicken noodle, such as the Campbell's variety in the other photo. I like to add healthful ingredients to canned soup, too. 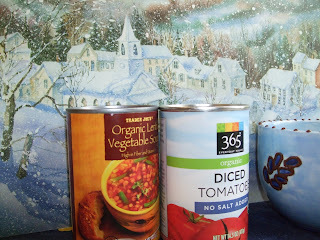 One no-brainer is diced, no-salt-added tomatoes--perhaps 1/4 to 1/3 cup per serving. Another interesting addition is (believe it or not) baby food veggies, such as carrots or green beans--spoon a jar into your soup before you microwave to heat. And finally, I doctor up the soup with a dash of cayenne pepper and (sometimes) a sprinkling of dried oregano or thyme. Have some whole wheat bread or a few whole grain crackers and voila! it's a meal. We hadn't been to Hugo's in a couple of years, so when new friends suggested it for a get-acquainted dinner, we happily concurred. We knew Chef Sean Daly when he used to cook at Tink's in Clifton and wish him all the best in his own place. But the dinner on a very cold January night--when Sean was not in the kitchen--was a bit of a disappointment overall. The restaurant was less than fully booked on a Saturday night, which probably is the case all over town in the dead of a Cincinnati winter. The dining room was much too cold, and repeated requests for more heat had no discernible effect. Our server was pleasant and efficient and the pace of our meal was fine. 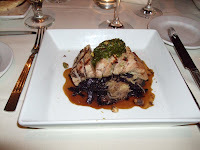 Food wise, most of the dishes were good to very good. 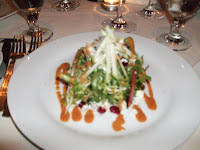 Our salads--from a rich caesar to butternut squash ("not enough squash") to my frisee with apples and a bit of blue cheese--were adequate. 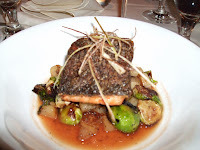 For entrees, my husband said his salmon with Brussels sprouts was ordinary; the shrimp and grits were good (I didn't taste them), the special short ribs were outstanding, and my pork loin with spaghetti squash and pesto was the best thing I tried. Dessert choices were extremely limited--just three items--and the blueberry cobbler with vanilla ice cream that made it to our table had nothing going for it. I had noticed a nice selection of dessert wines by the glass on the wine list, and since none of the desserts rang my bells, thought I'd try a dessert wine. But it turned out that almost all were "out" and all that was available was port or sherry, neither of which fit my mood. I think we probably just hit them on a down night, and maybe if Sean had been in the house it would have been a better experience. Hope so! Cocktails at home -- fun! 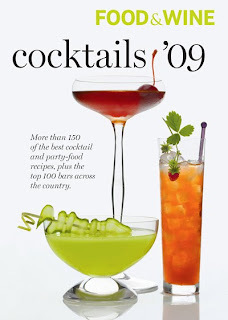 This new cocktail guide, published by Food & Wine Magazine, has started me on the road to amateur mixology, aka making terrific, inventive cocktails at home. 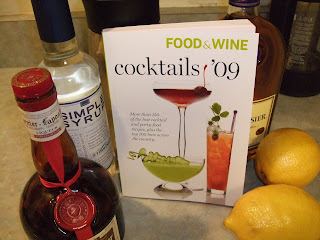 Chapters include Latin Drinks, Classics, Mixologists' Drinks, and Frozen Drinks (that one written by Adam Seger of Nacional 27 in Chicago, whom we met in November at his bar). There's also a list of the nation's top 100 bars and a "cocktail clinic" that explains all you need to know to try this chez vous. First up, from the Classics chapter, I made a Sidecar; I used Grand Marnier instead of Cointreau because I had none of the latter on hand--which made for a more potent drink. For the record, the recipe is 2 ounces cognac, 3/4 ounce Cointreau or other orange liqueur, 3/4 ounce fresh lemon juice and 1/4 ounce simple syrup. Shake well with ice and strain into a martini glass or over fresh ice. When the days are short, the temperatures cold, and the snow is piling up outside -- as it is in Cincinnati as I write today, try this hearty dish that's filling, comforting and very good for you. The beans are fiber-packed and full of vitamins and micronutrients, there's lycopene in the tomatoes, and more fiber and vitamins in the other veggies. Polenta gives you the carbs to help you feel full. Sprinkle with a little Parmesan cheese for added calcium and protein. 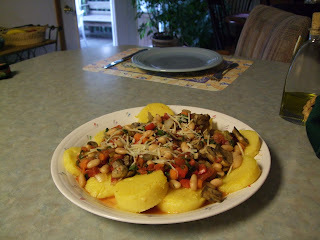 For polenta: I use the “log” style of polenta found in the International (or Italian) section of most grocery stores. Slice into rounds about one to one-and-a-half inches thick, then sauté in a nonstick frying pan over medium-high heat. If you want a golden color, sauté in a stainless steel or cast iron pan with a little canola or olive oil. You can also serve the bean dish over pasta or brown rice. Instead of only bemoaning our nation's obesity epidemic and food-safety lapses, here are some actions you/we can take to improve things -- however incrementally. 5. Know where your food comes from (read labels), and shop at grocers who label the origin of foods. These are adapted from the list on the website for the movie, "Food, Inc."
We had it with grilled salmon and a green vegetable. It also would be nice over lettuce, perhaps sprinkled with a little blue cheese, for lunch. 1. 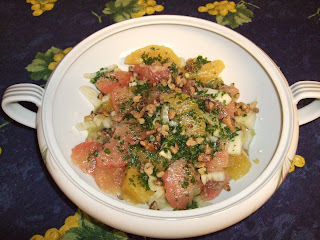 For the salad: Combine orange, grapefruit and fennel in a bowl. Stir well. Drain off as much juice as possible to add to the dressing. Stir in walnuts and set aside. 2. For the dressing: Put all ingredients except oil(s) in a food processor and pulse until basil is chopped. Add oil slowly with processor running. The dressing will be thin, not creamy. 3. Pour dressing over salad and stir well. Serve! This is a lovely recipe for the new year -- using healthy ingredients that are inexpensive and in season -- from the New York Times. It's rather labor-intensive, but if you make the whole batch, they'll keep either uncooked or cooked for many days--great for leftovers. If you want to add some protein to the filling, stir in a little cooked ground turkey, chicken pieces or cubed tofu. 1. Bring a large pot of water to a boil while you carefully stem the collard greens, trying to keep the leaves intact. Fill a bowl with ice water. When the water comes to a boil, salt generously and add the collard leaves in batches. Blanch two minutes and transfer to the ice water. Drain, gently squeeze out excess water and set aside. 2. Heat 2 tablespoons of the oil over medium heat in a large lidded skillet, and add the onion. Cook, stirring, until tender, about five minutes. Add the garlic, salt and sugar, and cook, stirring, until the garlic is fragrant, about a minute. Add the rice and pine nuts, and stir together until the rice is coated with oil. Stir in the tomatoes, currants, cinnamon, allspice and salt and pepper to taste. Stir together, and add 1 cup water or enough to barely cover the rice. Bring to a boil, reduce the heat, cover and simmer until all of the liquid has been absorbed, about 20 minutes. Remove from the heat. Allow to sit for 10 minutes without disturbing. Stir in the mint and dill. 3. Oil a wide, deep, lidded sauté pan or saucepan with olive oil. To fill the leaves, place one on your work surface, vein side up and with the stem end facing you. The leaf may have a big space in the middle where you stemmed it; if so, pull the two sides of the leaf in towards each other and overlap them slightly. Place about 1 level tablespoon of filling on the bottom center of each leaf. Fold the sides over, then roll up tightly, tucking in the sides as you go. Place seam side down in the pan, fitting the stuffed leaves in snug layers. Drizzle on the remaining 2 tablespoons olive oil, and pour on the lemon juice. Barely cover with water, and top with a layer of lemon slices. 4. 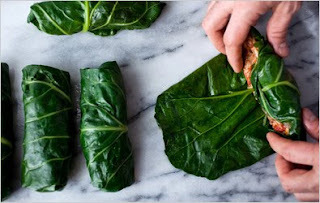 Cover the stuffed leaves with a round of parchment paper, and place a plate over the paper to weight them during cooking. This will keep them from opening. Bring to a simmer, cover and simmer over low heat for 45 minutes to an hour until the leaves are tender. Remove from the heat, and carefully remove the dolmades from the water with a slotted spoon or tongs. Allow to drain on a rack set over a sheet pan. Serve warm or cold. To resolve, or not to resolve? 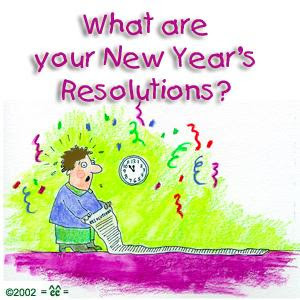 How often do you make new year's resolutions? Every year, sometimes, never? I'm pretty much in the "never" response category, but not because I can't find anything to improve about myself. Au contraire! Resolving to do better about something is almost literally a daily occurrence, with dropping a couple of pounds being rather high on the list. In the spirit of renewal--not only a new year, but also a new decade--what would our resolutions for 2010 be? I mean on top of any personal goals of self-improvement, such as really getting to a healthy and comfortable weight. What contributions can we make to the world around us? My first thought is to help find ways to do something positive about our nation's obesity epidemic. While Americans' health has improved since 2000 on some measures, such as lower death rates for cancer and heart disease, on other measures we have fallen back. As the costs for our health care continue to rise, far outpacing inflation, we have gotten heavier, we still smoke too much, and diseases such as diabetes have taken on epidemic proportions here. Here's an interesting article from the federal agency, Occupational Health and Safety Administration, called "The decade [2000-2009] in health and safety." As healthy foodies, we should be in the forefront of demanding that our food industry clean up its act and stop contributing to our nation's declining health profile. 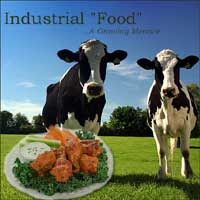 (See the movie "Food, Inc." on DVD if you want to learn more about our country's industrial food system.) As individuals, we can demand that the restaurants and grocery stores we patronize make healthier food choices easier for individuals to make. Also see the Food, Inc." movie's website for its list of "10 simple things you can do to change our food system." Congress and our state legislatures need to get into the fray and (for instance) give the Food and Drug Administration (FDA) much broader enforcement powers. The U.S. House has passed the Food Safety Enhancement Act; we should encourage the Senate to move forward and enact this legislation. These are just a few ideas for the New Year. If you have others, please share them! Here's a simple recipe for New Year's weekend--colorful, flavorful and with ingredients your body will thank you for. From the broccoli, you get antioxidants, fiber, Vitamin A; tomatoes add lycopene and Vitamin C; olive oil provides mono-unsaturated fats (the best kind); and whole-grain pasta adds more fiber and other important vitamins and nutrients. A little cheese brings calcium and protein--not to mention a delicious salty flavor!